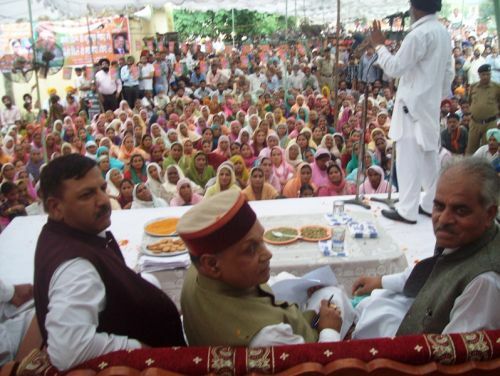 At the Panjehra rally in Nalagarh, Chief Minister Prem Kumar Dhumal said that State Government had provided financial benefits amounting to Rs. 7500 crore to State Government employees. He was addressing a massive. He said that the present Government had implemented a number of schemes envisioned to facilitate every section of the society especially weaker sections which had been immensely benefited with the visionary policies and programmes implemented during past four and a half years. Prof. Dhumal said that the State Government had never differentiated between the policy it envisioned and the will to implement the same. Prof. Dhumal said that Himachal Pradesh was giving its consumers regular, cheap and uninterrupted supply of electricity in the country. Electricity duty was decreased up to five percent to the new entrepreneurs for setting up industries along with other facilities. He said that four CFL bulbs were provided free of cost to every domestic consumer under ‘Atal Bijali Bachat Yojna’ which saved electricity worth Rs. 110 crore. He said that social security pension had been enhanced from Rs. 200 to Rs. 450. 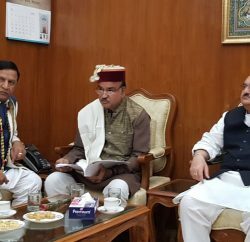 He said that the Government had provided basic facilities like Subsidised Ration and housing facilities to the BPL families, needy and the poor. Chief Minister said that steps had been taken to provide better educational infrastructure to the youth of the State. Efforts had been made to provide qualitative higher and vocational education to the youth by opening various higher educational institutions so that they may be in a position to associate themselves with latest technology advancement. He said that net books were being provided to the students along-with scholarships to meritorious students and added that ‘Atal School Uniform Scheme’ had also been launched under which free uniforms twice a year alongwith Rs. 100 stitching charges were being provided to the students. Prof. Dhumal announced to upgrade the Primary Health Centre at Ramshehar to Community Health Centre and Government Primary School in Gram Panchayat, Kebri to Government High School. Chief Minister said that Rs. 89.44 crore had been sanctioned for construction of Baddi-Nalagarh-Swarghat road out of which Rs. 59.96 crore had been provided. Prof Dhumal was presented a draft of Rs. 1.51 lakh towards the Chief Minister Relief Fund by Sh. K.L. Thakur who joined the BJP with his supporters. 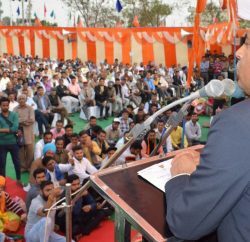 Dr. Rajeev Bindal, MLA and former Health Minister said that the policies and programmes of present BJP Government had benefited each and every section of the society by implementing various welfare schemes. 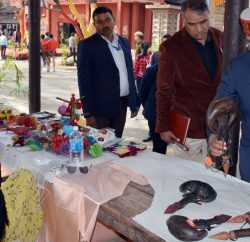 Vinod Chandel, MLA, Baldev Thakur, BJP Mandal President, Avtar Singh Saini, BJP functionary, senior Officers of the State and many prominent people were present on the occasion.